Chop saw and miter saw are often mistaken for one another. And while it’s true that they have confusing similarities, these two tools have significant differences that make one a more effective and appropriate tool for certain purposes than the other. So, to set records straight, we’ll discuss in brief the basic similarities and differences between the two in terms of their appearance, characteristics, function, and, finally, their application. Now, before you head for the shop, let’s look at how similar and different one is from the other. This is particularly important especially if you want to make the right decision in picking the right tool for your material and needs. Using the wrong tool can put your safety at risk and cost you much time, money, and effort while using the right tool can save you valuable resources. At first glance, a chop saw and a miter saw may look the same. Both tools have round blades mounted to a hinged arm as well as a stationary base that supports the material. But make no mistake as these two tools actually have more things different than they have in common. A chop saw has an abrasive disc that looks like a thin grinding wheel, which performs the cutting action. It has its motor and cutting wheel mounted on a rotating arm connected to a fixed base plate, and does not have regularly shaped cutting edges or teeth. Typical miter saws consist of a laser guide for precise positioning of the cut on the workpiece, a blade guard to cover the cutting blade’s teeth, a dust bag that helps keep the workpiece clear of sawdust, and a safety clamp, which is especially important in keeping small workpieces firmly locked in place when cutting. It also has a miter index, which may adjusted to changed the angle of the blade relative to the fence, and a miter table, which is normally 24 inches in diameter. One major difference that these two tools have is the axis. A chop saw’s blade is always perpendicular to the table and can only do straight 90-degree cuts. A miter saw’s axis or shaft, on the other hand, swivels, which enables the blade to cut angles and also do 90-degree cuts just like a typical chop saw can. That being said, a miter saw can function as a chop saw but a chop saw cannot function as miter saw. Thus, “chop saw” is used as a generic term that refers to a stationary power tool that cuts material in a straight downward motion while “miter saw” is a term used for chop saws that can create angled cuts like beveled and mitered cuts. 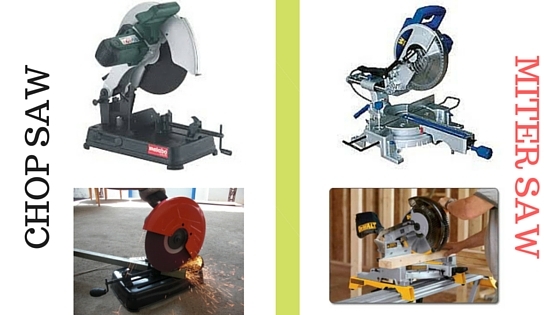 Commercial chop saws are generally fast and should only be operated by professionals. These saws are operated by using both hands to feed the lumber through the saw and by using foot or knee to control the switch with hydraulics. Miter saws come in different types. There’s the power miter and manual miter saw. Power miter saws may also be classified as standard, compound, and sliding compound miter saws. A power miter saw is a real time-saver as it allows users to make precise and repetitive vertical straight or angled cuts on lumber, moldings or small boards. This type of miter saw is commonly used for framing operations and cutting of moldings. It is also relatively small and portable with blades ranging from 8 to 12 inches. The hand-operated or manual miter is the type of miter saw then can never be mistaken for a chop saw. It has no motor, it’s slower than a power miter saw, and, just like the chop saw, can accurately cut 90-degree angles as well as simple angles. The other three types of power miter saws are the standard, compound, and sliding compound miter saws. A standard saw has a fixed vertical pivot with rotating cutting table while a compound miter saw has a rotating vertical pivot with a horizontally rotating table. Like the standard miter saw, the blade of a compound miter saw swivels but can also tilt sideways to create compound angles so professional woodworkers often use this type of miter saw. Chop saws and miter saws with blades entering the wood from above are commonly referred to as drop saws. Another type of saw that can also be used as a miter saw is the radial arm saw, which slides horizontally across the wood. Although both miter saw and chop saw accept wood- and metal-cutting blades, the term “miter saw” is specifically used in woodworking while the term “chop saw” is used more in building sites or production shops. Chop saws are ideal for home-building and framing works because it has bigger cutting capacity than miter saws. They are useful for cutting large pieces of metal or wood planks at 90 degrees. For a fine woodwork finish in carpentry projects like baseboard installation and molding, the miter saw’s ability to create beveled cuts would definitely be of good use. Generally, a miter saw may also be deemed low-hazard since the workpiece is held against the fence in a stationary manner while the saw head moves. Kickbacks are less likely to occur when using miter saws, which also keeps the user’s hands clear of the blade. Whether you’ll be working with wood, metal or any kind of hard material, there’s a type of saw that’s appropriate for your cutting needs. The key is to know which one to use so you can maximize a tool’s capability, increase your efficiency, and get your desired results.